According to the University of Florida (http://edis.ifas.ufl.edu/in601) the hieroglyphic moth should appear in late summer and fall, and should be white or cream colored. 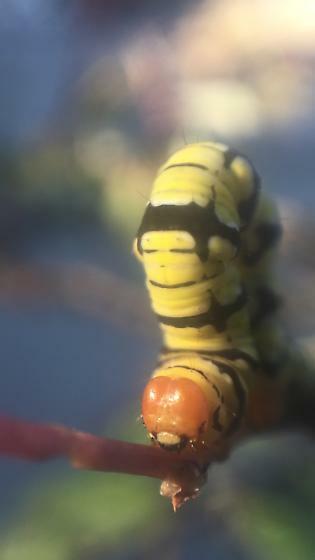 This larva seems to have all the appropriate characteristics, save that its base color is yellow and it has appeared in early June. I haven’t located any similar species within the Noctuidae family, but perhaps someone here has more information regarding other species, or variation within the species... Thanks much for your help! Thanks so much! I had originally tentatively identified it as a Geometrid due to it’s form of locomotion, but I saw several shots of the hieroglyphic moth in the same position and began to doubt. I have since found the appropriate information for the species thanks to your lead.